I know, I am only 18 and I don't even have an entire place to myself to decorate but I still have always had a huge appreciation for interior design. I've have always helped my mom decorate our house and find myself constantly changing up my own room. Since my family and I are home for the holidays, I've have been obsessed with decorating the house and filling it with things I love and that look good. Since I just moved into a new home, me and my sister have our own loft area that we are decorating. 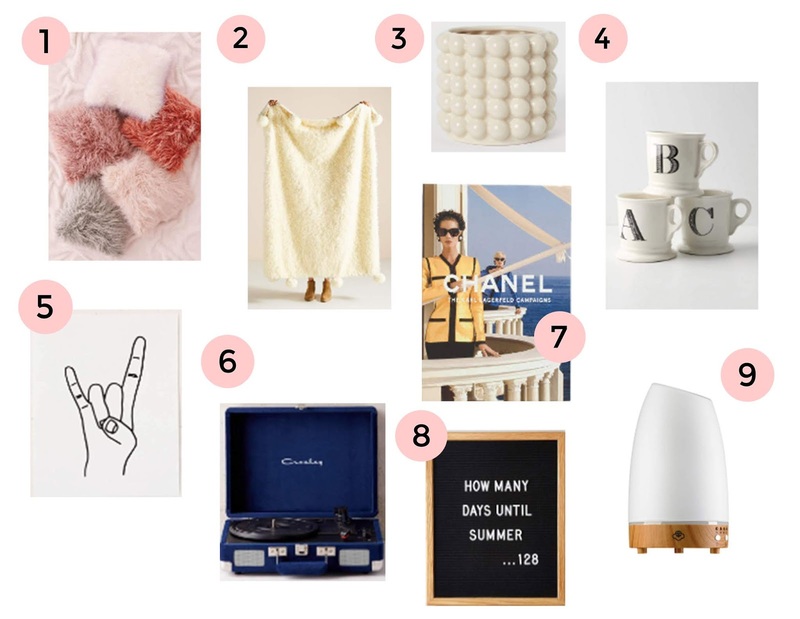 While working on a gift guide for Chanel Kind of Girl, I actually got sidetracked and started online shopping for my new space and decided to share my favorite products that would make the most perfect gift for your holiday host or anyone in your life that's obsessed with interiors. 1. Faux Fur Pillow- Nothing more luxurious than faux fur during the colder months. I love throwing a few of these on the sofa or my bed. 2. Fuzzy Blanket- I have the same blanket and it is literally the softest thing in the world. Everyone including my fog are obsessed with it. 3. Planter- This is the cutest gift and you could even pair it with a small succulent to give someone a new little friend. 4. Initial Mug- A monogramed mug is super sweet and personalized. You could even fill it with some fun stuff to make a good cup of hot coco. 5. Wall Art- Wall art is a great way to fill up any space add a little personal touch to a space. My favorite places to find some unique pieces is Urban Outfitters and Society 6. 6. Record Player/ Record- I just got one for my birthday and it has become my new favorite way to listen to music. If your friend already has one, then another option would to be getting them a record. That be a great gift because you could even gift them a record of your guys favorite band to make it more personal. 7. Coffee Table Book- I am definitely am not an advent reader but I do love me an good coffee table book. I mean if I am honest, I love them because they are usually filled with picture. I linked down below my favorite designer book, but there are other books like everything from the people of NYC to the secret places of the world to visit. 8. Letter Board- They almost act as a wall art but can be changed to anything which makes them so versatile. I think it is such a sweet idea to put a sweet little message on it. 9. Defuser- I love my defuser so much, I mean I can not say a single bad thing about it. It fills your space with fresh smells, healing, and balance your body. It is perfect especially for the cold seasons as it helps especially balance sinuses.